Barry Schiff needs no introduction. He is known throughout the industry as a consummate aviator, author and educator with a passion for General Aviation like few others. His seemingly boundless experience and knowledge are surpassed only by his warm, rich writing style and unforgettable presentation techniques. 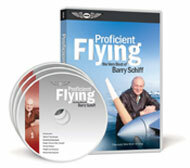 In Proficient Flying Barry uses these educational skills to help pilots visualize techniques and procedures that can make them safer pilots. He brings critical subjects to life in this DVD series with more than 4 hours of instruction. Schiff's knack for guiding pilots through intricate aspects of flying makes these lessons invaluable and memorable, giving viewers true insight and understanding of the subjects presented. The full set of DVDs, with over four hours of instruction, are just $39.95. To order online: Your order is secure using PayPal. You do not need to have a PayPal account to use our shopping cart. We ship to United States addresses only. Barry wrote and produced these now-historical recordings between 1959 and 1963. They provide a unique perspective to what flying and flight training was like during that period. Much of it, though, is still valid. Originally recorded on long-play, 33-1/3 rpm recordings, they have been faithfully reproduced on archival-quality CDs and are described below just like they were when originally released. All were recorded in flight and then edited and professionally narrated at Capitol Records in Hollywood. Listen to and become familiar with all radio aids to navigation as they are being used. These include low-frequency (4-course) radio ranges, omniranges, marker beacons, a cone of silence, as well as various forms of in-flight communications. The highlight is a complete ground-controlled radar approach (GCA) that goes all the way to the squeak of the tires at Los Angeles International Airport. This recording takes you along on an actual instrument flight in a Cessna 310 from Los Angeles to San Francisco. You receive a pre-flight briefing, file a flight plan, and then listen in on all air-ground communications while en route. This double album (2 CDs and more than 2 hours of recording time) was an ambitious recording project that takes you on a real cross-country flight, a VFR flight all the way from LAX to Idlewild (as JFK was then called). It is not only entertaining, but you will learn from the manner in which innumerable problems encountered along the way are resolved. This popular recording removes the mystery and mystique from two-way radio communications. It makes it easier to learn how to use the radio and helps to relieve anxiety (mike fright), especially for those learning to fly at controlled airports. These are the fundamentals needed to communicate efficiently with the control tower while on the ground and in the traffic pattern.